CMS Compliance Group will be leading an audio conference for Leading Age NY on May 8, 2012. CMSCG President, Linda Elizaitis, and Keith Reilly, Senior Consultant, will discuss the kitchen and dining observations that are part of the Quality Indicator Survey (QIS). 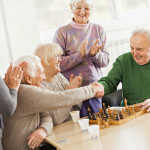 The QIS has set the bar high for the dining experience in nursing homes. The resulting focus of the QIS on dining observation and its wide range of potential citations creates a strong need for an interdisciplinary approach to dining. If dining does not go properly during a QIS, facilities leave themselves vulnerable to a host of citations, including in the areas of Quality of Life, Quality of Care and Infection Control. The appropriate multifaceted approach to dining will be discussed in a panel format by a Registered Dietician, a Registered Nurse and a Licensed Clinical Social Worker to help your team prepare for the QIS. Registration for this audio conference is open through May 7th, and can be completed on the Leading Age website. Even if your state has not implemented the Quality Indicator Survey, this program will provide valuable information for your staff to prepare for your next survey.